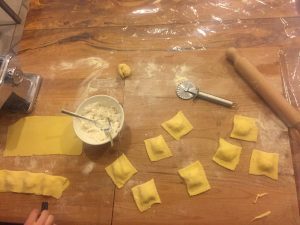 Taking an Italian cooking class is probably on a lot of peoples’ bucket lists for when they visit Florence or other parts of Italy. It was certainly on mine, so I was eager when I saw that SAI offered them so frequently. At home and at my school in the U.S, I cook nearly all my meals and get excited about making new recipes with my roommates. However, when I got to Florence, I found cooking frequently a little more difficult for a number of reasons. I’ve gotten so used to the exact products I buy at my grocery stores at home, so it was difficult to adjust to the differences in products. It can also be hard to cook when you’re busy meeting new people and experiencing Florence, and when you’re tempted by all the restaurants around you. I was excited to take a cooking class and hoped that it would get me back into the swing of cooking on my own. At the class, we got to mix our own pasta dough and learned how to roll it out. 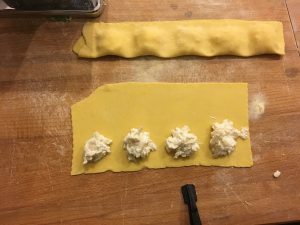 We made pear and pecorino ravioli, so we learned how to fill our rolled-out sheets of dough with the filling and used different tools to cut the pasta. Together we also made an appetizer and tiramisu for dessert. Once we finished cooking, we all sat down together and ate each course. I loved the class and got exactly what I wanted to get out of it. 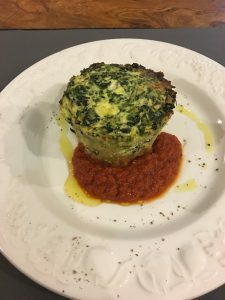 I’m not only inspired to continue cooking at home, but the class made me excited about all the resources I have in Florence and reminded me that I should embrace what I have access to here. Willa is a spring 2018 SAI Florence student from the University of Wisconsin-Madison.